Cheryl T. submitted this photo and caption. I noticed that you do not have many photos of the Cavaliers in your DC-Eye gallery. Many Cavalier parents and supporters have taken thousands of photos which we have shared amongst ourselves, but I would like for the rest of the DCI organization to see why we are so proud of our guys. 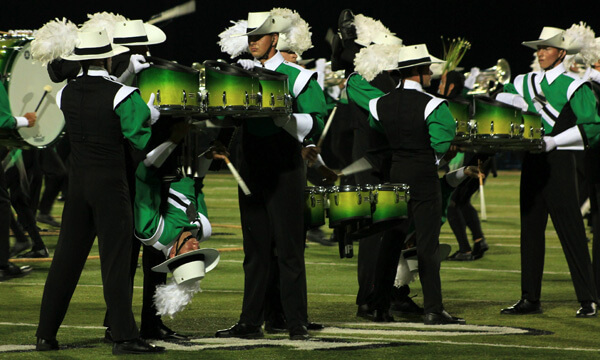 It is also fitting that you should have photos of the BEST drum line in DCI! My nephew was a member of the 2011 Cavaliers and I had the extreme fortune of being a part of the organization myself. I spent two weeks driving one of the equipment trucks, one week driving the souvenir truck, and (living in the Indianapolis area) was with the Cavaliers during Finals. This photo was taken on June 16, 2011, at Broken Arrow, Okla. The event was a dress rehearsal and "fan appreciation night" which was well attended by the citizens of the Broken Arrow and Tulsa areas.